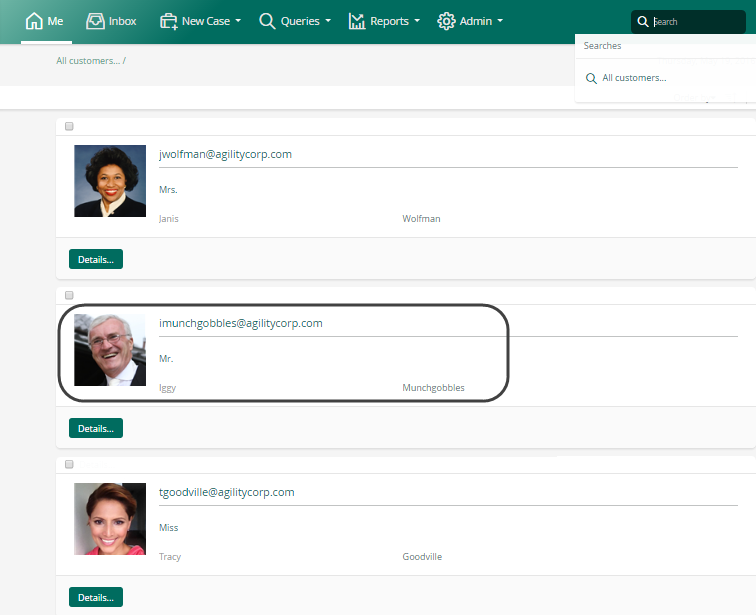 When browsing over data, either regarding results of data searches or lists of information which are part of My stuff, you may customize the information displayed for these resulting records. You may define any number of data templates and use them separately according to stakeholders and contexts. For more information about data searches or My stuff configuration, refer to Contexts. By default, Bizagi uses a basic template that chooses random attributes of the entity to which a record belongs to. You may define your own data template, while considering the following 2 types of data templates. 1.List type templates: Used automatically whenever you are viewing a list of records (e.g, 1 or more results thrown by executing a data search or viewing My stuff items). 2.Content type templates: Used automatically when displaying the content of one specific record. Note the content template would be available for additional information contained within another entity directly related to that record; mainly because the action by itself already defines a form. 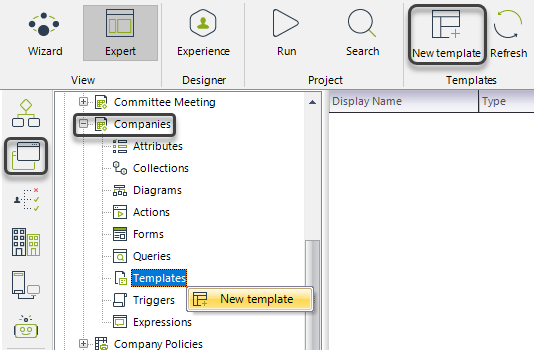 In order to define a new template, go into the Expert view and click Entities. Locate the entity for which you want to design a template (any type of entity, be it master, parameter or stakeholder) and go into the Templates item. 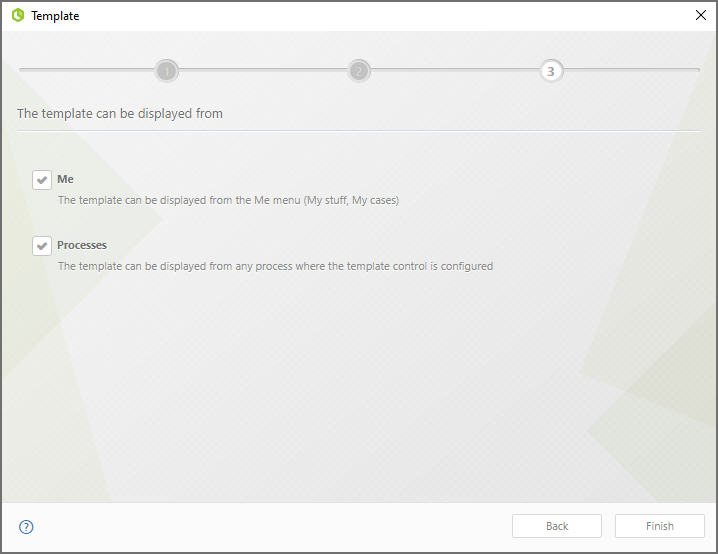 For the new template, in the first step configure its Display name, and Type. Then select a layout from the list of available ones for that template type. Images are available to be included in the first and last layout. The last layout has a fixed number of columns and rows. 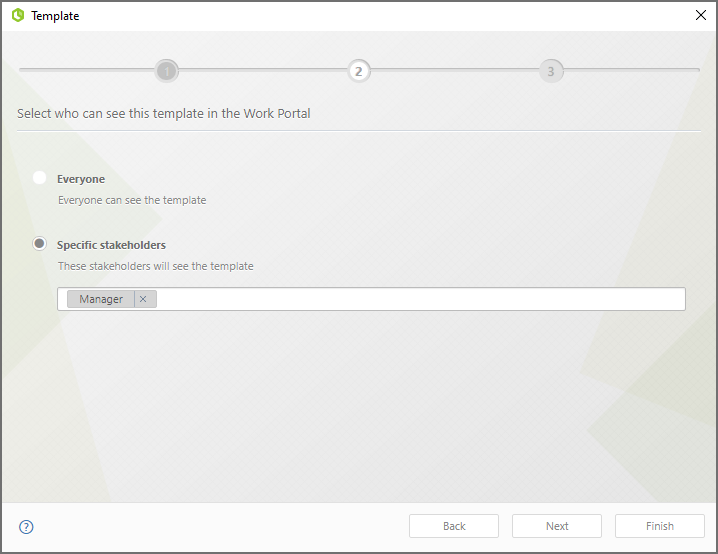 In the second step, define if this template will apply for features in the Me menu and if it will be also available from within activity forms of processes. In the final step, define which stakeholders have access to this template. If you do not wish to use the Everyone default configuration, mark Specific stakeholders and enter the names of allowed stakeholders, separating them by inputting Tab. Click on finish to launch the Templates designer and define which information the template will present, and how. Clears a placeholder so that you can include a different field. For list type templates no further configuration is needed, just making sure you create the template at the right entity. For content type templates, you need to define a form which uses the Entity template control specifically and targets that content-type template. Notice you need to select: the Data source for this template, which should be an entity you can navigate to through Xpath, and its template (alternatively, you may define a template at this point from the drop-down options). Make sure you click Save when done. 1.Data templates are always read-only. Both list and content type are designed and displayed for explicit purposes of viewing summarized information. 2.One list type template is applicable. Though you may define many data templates for a same entity, Bizagi will only use 1 list type template when displaying multiple records, given that the use of a list template is automatically determined by Bizagi. You may define multiple content type templates and use all of them separately, from different forms including them. 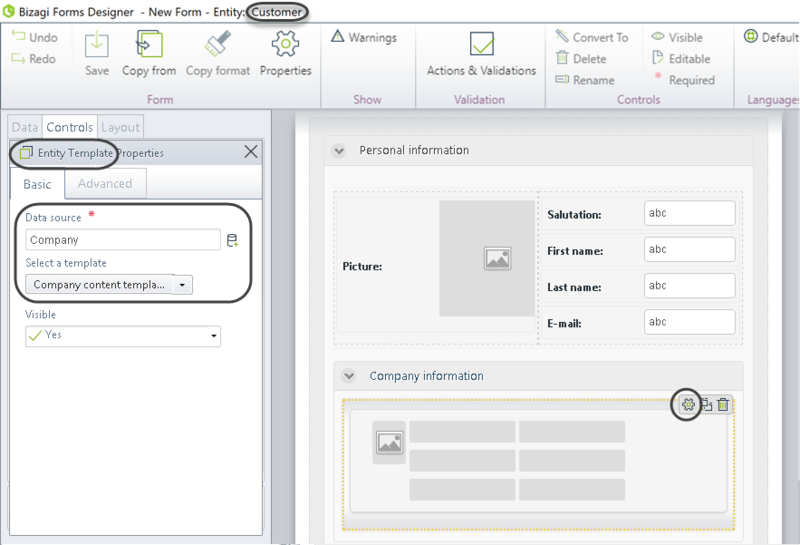 3.Full options in the Forms designer are not available for the Template designer. 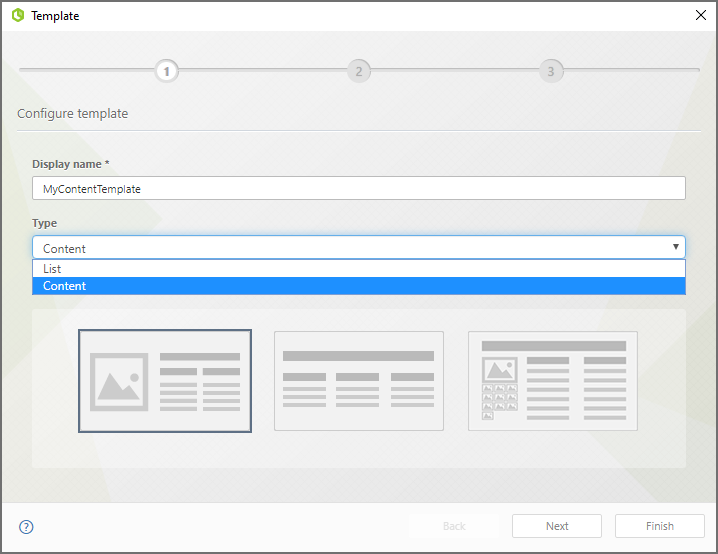 When defining data templates, slightly different options are presented in the Template designer when compared to the Forms designer. Not all options of the Forms designer are available at this point.